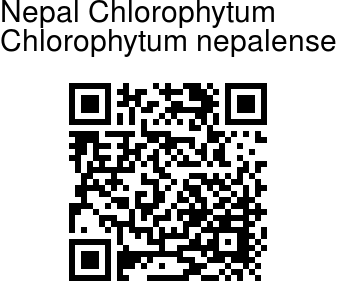 Nepal Chlorophytum is a bulbous plant with a short, inconspicuous rhizome. Leaves are stalkless or slightly narrowed and stalk-like basally, linear, narrow, 8-60 cm long, 0.6-2 cm braod, hairless. Scape erect, 30--60(--90) cm. Flower raceme are sometimes few branched and panicled, many flowered. Bracts are linear-lanceshaped, shorter than flowers. 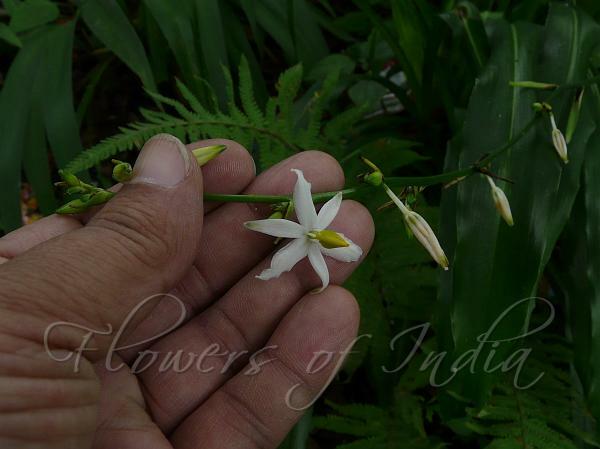 Flowers arise solitary or in clusters of 2 or 3, on stalks about 1 cm long, jointed near middle or distally. Tepals are white, narrowly oblong-elliptic, 1-1.4 cm × 2-3 mm. Stamens are slightly shorter than tepals, anthers usually longer than filaments. Capsule is obovoid, rarely round, 6-9 mm; seeds several per valve. Nepal Chlorophytum is found in the Himalayas, from Nepal to NE India, Assam, at altitudes of 1400-2500 m. Flowering: June-September. Identification credit: Krishan Lal Photographed in Gangtok, Sikkim.